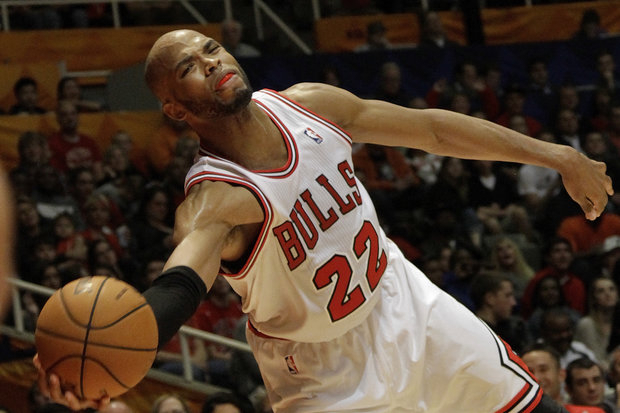 Taj Gibson is an important cog to the Bulls this pre-season. I normally don&apos;t put much stock in the NBA pre-season, but this year is different for the Bulls. We know what the big issue is — no Derrick Rose — but there are other reasons to pay attention besides the injured All-Star. Last year&apos;s lock-out took a huge toll on many fronts. Remember, the league cut training camp short and crammed 66 games into the schedule. When a team has a head coach like Tom Thibodeau, the use of practices, especially during training camp, are imperative to learning and absorbing the Bulls system. Without Derrick Rose, offense will be at a premium. Richard Hamilton needs to deliver. Hamilton was supposed to provide Rose with offensive help in the backcourt. But the guard was badly affected by the shortened camp and a late signing caused by the labor dispute, and plagued by injuries most of the season. This fall, “Rip” is looking more like the player the Bulls originally hoped to sign, moving well and playing sound defense. But he&apos;s another year older; you have to hold your breath wondering if this fragile player can sustain a full season. So does Jimmy Butler. This is Butler’s second season with the team. As a rookie last season the guard had to “learn on the fly.” Then the NBA renewed their summer league play after it was shut down last year and Butler was able to participate, spending a lot of time working out with fellow players and staff. The coaching staff and the team root for Butler and would love to see him succeed (his upbringing is similar to that of Baltimore Raven Michael Oher, the subject of the movie Blind Side). Butler told me he needs to build confidence and wants to be more of a factor coming off the bench. With the "bench mob" broken up, what comes next? Taj Gibson is taking his role seriously as the leader of the newly revamped bench, but pre-season and training camp have been works in progress in this respect. Gibson had a terrific camp, spelling both Carlos Boozer and Joakim Noah off the bench, and his growth as a valuable player may have a payoff — if the team decides to give him a contract extension before the October 31st deadline for four-year players. If the Bulls fail to make the deal, they risk losing Gibson as a restricted free agent. It stung for the team to lose Omer Asik to Houston in that manner; losing Gibson would be troubling to say the least. Newer Bulls have been hit-or-miss so far this pre-season. Thirty-five-year-old Nazr Mohammed has done a good job with his playing time on defense and has scored some points but Marco Belinelli is still trying to get his shooting squared away and has been frustrated about his difficulties. Coach Tom Thibodeau believes Belinelli&apos;s shot will come, and said the guard has been doing other things on the court. One player who hasn&apos;t seen much playing time is Vladimir Radmanovic; it seems his conditioning has been a factor. All the new faces are still feeling their way around a coach that is more demanding than most in the league; but they all echo how much they respect Thibodeau. Finally, yes — Derrick Rose has been working out at the Berto. But again, there is NO timetable for his return. When you see him at the practice facility or the United Center there is no sulking; his demeanor has been very positive. Next week the real season begins against Sacramento on Halloween night. The Bulls hope all their prep this pre-season won’t scare anyone – except the Kings.